Of course the classic gifts for Valentine's Day are Chocolate and flowers. However, unless you've been given the actual plant, flowers don't last that long. So! I have come up with an idea. Instead of actually flowers, you can get flower-themed treats instead! they'll last much longer! I have really dry skin, so body butter is always appealing. One that smells like roses? Yes. So, this is scented nail polish. I love that idea. Plus the color is a good one, too. Nice and bright and perfect for Valentine's Day. So, years ago, I went to Hong Kong for work with a woman named Dinah. I love her. She took me to tea at the Mandarin, and they had rose petal jam served with scones and clotted cream. It was delightful. I never thought, though, that you'd be able to find rose petal jam at Walmart. For an extra-special Valentine's Day tea time, make some (non-dry (why are they always so dry?)) scones, and clotted cream and dine upon them with some rose Jam. I never thought about hair perfume, but I like this idea a lot. I love when I catch a whiff of my own hair, so I imagine it would be even better if it literally smelled like roses. I originally saw this clutch on Charming Charlie, but it was so popular that it's out of stock! It's reminiscent of a Judith Leiber minaudière but with a much more affordable price tag. Since I had to link it to AliExpress, though, don't expect to receive this in the mail before Valentine's Day. I can tell I'm getting older because in the past few years I have really started to understand why people are so into candles. To be clear, I don't like the ones that smell like anything thick or heave - cookies, cinnamon, vanilla, etc.. - but a light rose-scented candle? I think I'd quite like that. A couple weeks ago, a friend who works at Sephora did masks on me and some friends while we caught up on TV shows. It was delightful. So, I think this clay mask could be a great way to celebrate galentine's day with friends along with a heart-shaped pizza and some sparkling grape juice. Who doesn't want a pair of chunky-heeled sequin pumps? There's only size 8.5 left in these shoes, so I guess a lot of people agree. They're necessary. I love this trend of floral-printed handbags. Search the word "Rose" on the kate spade website. You will not be disappointed. Back when I was not a starving artist, I used to quite enjoy the Chanel counter of Lord and Taylor near my office on fifth avenue. This was one of the products I purchased during that time, and I must say, it is delightful. I've since run out of this exfoliant, but the rose-scent was absolutely delightful. In fact, I seem to remember I also had a face cream from Chanel that smelled like roses in the best way possible. 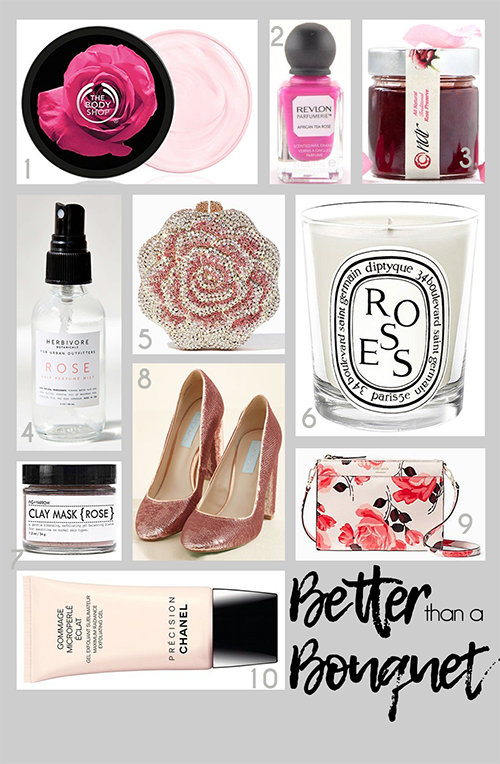 The scent is not too strong, but rose-enough to make your skincare routine a little more pleasant.